The attempted bombing of a U.S. airliner bound for Detroit on Christmas day and the Obama administration’s incoherent response to the terrorist event has sparked the re-emergence of the “terror frame,” which had been temporarily replaced in the American consciousness by more immediate and daily concerns associated with the economic crisis. However, coming into the 2010 elections, the staying power of the frame may ultimately determine whether Obama and congressional Democrats have the homefield advantage or end up as the visitors in a lop-sided Republican advantage. What I mean by frame is an ordering of cognitive constructions in the human brain that act as heuristic devices, or shortcuts, to reasoning and persuasion. For example, if I say the word home, there are associative measures, images, and words that accompany the home frame. Hearth, family, protection, warmth, community are just some of the associational measures the brain takes when the word or image of the home is evoked. Simply saying the word home can thus evoke that image along with the associative measures in the frame, either consciously or unconsciously. Frames are powerful devices and when strategically used by politicians, they can act as political shortcuts for persuasion and voting. Following September 11, 2001, the terror frame emerged after media (or first person) exposure to the events of that day. Additionally, the Bush administration’s immediate construction of the “War on Terrorism” framed the event and terrorism as a “war” and an “immediate threat.” According to cognitive linguist George Lakoff of UC-Berkeley, tragic or traumatic events re-order circuits in the brain to respond to the available information presented and order seemingly chaotic events. Lakoff argues that in the days and weeks following 9/11, the American people were vulnerable to a reorganization of their cognitive structures for politically expedient purposes on the part of the Bush administration. While I do not completely agree with this assessment, it is easy to see how the terror frame was born and was fostered. The Patriot Act, Homeland Security, the wars in Afghanistan and Iraq, enhanced interrogation, anthrax attacks, the “shoe bomber,” Osama bin Laden, “axis of evil,” and terror alert color levels are just some of the continual events and references that reinforced the terror frame. Responding accordingly, Republican congressional candidates (and Bush himself) successfully used the terror frame to maintain and expand majorities in the U.S. Congress during the 2002 and 2004 elections. 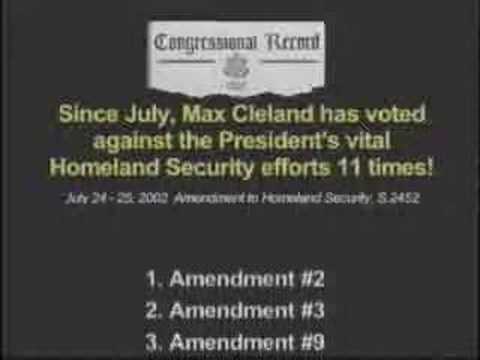 For example, the ad here was run during the 2002 Georgia Senate election between incumbent Democrat Max Cleland and Republican challenger Saxby Chambliss. Chambliss was able to use the terror frame against Cleland (a Vietnam veteran who had lost both his legs and an arm in the war) to frame the Democratic incumbent and Democrats in general as “soft on terrorism.” Chambliss won the bruising election. When the conversation changed as the wars in Afghanistan and Iraq went bad and as the subprime mortgage crisis threatened economic stability, Democrats were the beneficiaries of these events. The terror frame subsided and was replaced by other fears and worries about jobs and the economy. The attempted Christmas day terrorist attack may have revived an old frame and in the process revived Republican hopes for even greater gains during the 2010 midterm elections. Real Clear Politics, a political news aggregator, for example featured seven news stories or editorials out of 23 relating to terrorism in Friday, January 8, 2010 (including only the morning edition as of this writing). There was an additional special section on “National Security” containing three more articles. As a comparison, Real Clear Politics on Wednesday, December 23, 2009 featured 33 stories and only one had slightly something to do with terrorism (Iran and unrest). The media has been driving the frame and in typical agenda-setting fashion has kept the issue alive in the public consciousness two weeks after the attempted terrorist attack. Republicans jumped on the attempted attack as proof that the Obama administration does not understand that “we are at war.” Shortly after taking office, it became evident that the Obama administration was intentionally not constructing U.S. confrontation of terrorism as a “war.” In fact, they dropped the language of war altogether. Cognitively, the Obama administration was reframing terrorism as criminal, not necessarily an act of war requiring a military response. However, in the re-emergence of the frame after 12/25/09, the Obama administration was caught off its game. Barack Obama and his surrogates began to evoke the old terror fram e by stating in prepared remarks on January 7: “We are at war against al Qaeda, a far-reaching network of violence and hatred that attacked us on 9/11, that killed nearly 3,000 innocent people, and that is plotting to strike us again. And we will do whatever it takes to defeat them.” Welcome back “War on Terrorism.” While Obama did not explicitly use the word terrorism in this phrase, he used al Qaeda, which was constructed in the previous terror frame and is linked to terrorism. Just like the evocation of home, evoking al Qaeda evokes terrorism and its accompanying idea of war in the phrase and frame. Lakoff notes that when your opposition uses a particular frame, one should re-frame the event so as to seek ownership of the associated lingustic and visual appeals. By evoking the opposition’s frame, one perpetuates the opposition’s arguments. 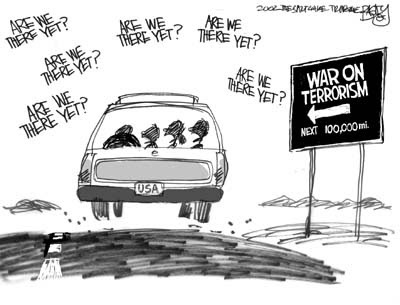 Obama, in constructing a “war” again, evoked the old terror frame, which was successful for Republicans in 2002 and 2004. He therefore walked into a linguistic trap and in the process undid his administration’s work to reframe terrorism as a criminal and not military issue. Whether it is using fear associated with a terror frame or fear constructed as part of an economic frame, both parties have taken and expanded power by using fear appeals. Playing on GOP turf could be detrimental to Democratic efforts to maintain comfortable majorities in Congress. Similarly, the terror frame evokes related frames of national security and defense – traditionally strong Republican issues. Accompanied with a lagging economy and mainstream media coverage perpetuating a frame Democrats probably want to go away, it is easy to see how a difficult electoral environment for the majority party can quickly turn into a toxic set of circumstances.